This device is designed to be used with the GVP Impact Vision 24 and was originally shipped with the CT or Pro version of the card. 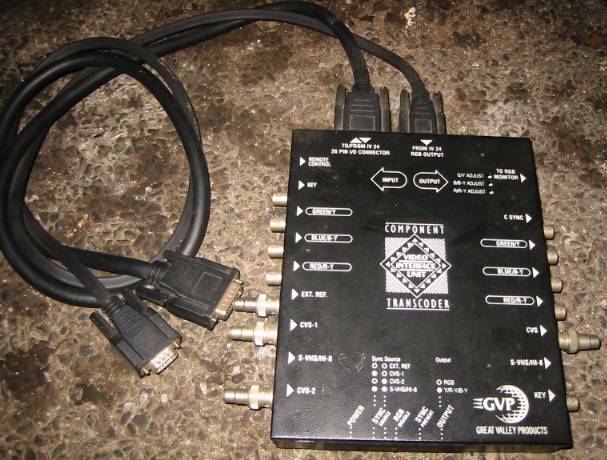 It is similar to the Video Interface Unit / RGB Splitter but also does Component Transcoding and has more outputs. The device is designed to mix three different video sources with the amiga's native video source, making it effectively a "Super Genlock". It can also be driven under Scala MM400. There are six activity LEDs on the front of the device. This what is called a transcoder. It changes video from one format to another, such as composite to R/G/B, or componenet R-Y, B-Y, and G-Y. S-VHS is another format, which is nothing more than baseband video with full bandwidth chrominance information on a separate cable. CVS stands for Composite Video Sync, the same as the usual baseband video we all know. The Key output is the Alpha channel, which is used with a video keyer. It is the signal that 'cuts the hole' for video keys.